Spoils from the Old and New worlds! Just returned from abroad with a Laúd Cubano (left) and a Spanish Laud (right). I found the Cubano in ARTex in Havana. Cuba not being a country of excess, their music section had 4 basses and one guitar and some gueros. When I said “I am looking for a laúd Cubano” they all shook their head. Not entirely for linguistic reasons. Alas, it looks pretty, but it’s not really playable! So when we stopped over in Madrid en route, I asked the advice of a more well-to-do music store. Comparing it to their Spanish Laud they confirmed the strings and tuning were more or less the same. I suggested a trade-in but the hombre remained skeptical. So I then snuck a teeny eeny audition of this new old world instrument, and lo and behold ¡Perfecto! it was more than playable. 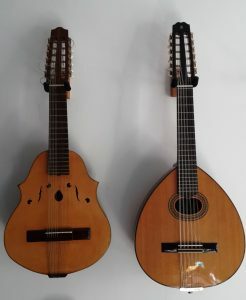 Made by Alhambra, an eminent Spanish luthier. Hence, the greatest airline “heist” of recent times when Iberia found itself rather short of locker space. I had pushed onboard allowance to new limits, but finally arrived home in .. well, more than one piece. And I realised that I was no longer a mere multi-instrumentalist, but now, ahem, a collector. Jeeves, pass me that Cohiba! This entry was posted in Cuba, instruments.